54 FLEX007 MAGAZINE I JANUARY 2019 Figure 5 shows a diagram of a flex circuit with stiffeners. Stiffeners are used for assis- tance with connector insertion or component placement rigidity. The stiffener and coverlayer termination points should overlap to avoid a stress point, helping to reduce the chance of traces breaking and cracking. Tolerances for Manufacturing Manufacturing tolerances should be pro- vided in the documentation data package. Tra- ditionally, the manufacturing tolerances are covered in design documentation which pro- vides a complete description of the finished product. Most documentation formats provide a tolerance block near the title block for the drawing. The tolerances called out in the toler- ance block should accurately reflect the appli- cation of the finished flex product. Flex and rigid-flex designs are subject to meet criteria listed in IPC-6013, which is specific to flex cir- cuits. Special Electrical Testing Requirements The electronics industry is continuously mov- ing to ever higher operating speeds, and special tests are needed to ensure performance. Elec- trical testing requirements such as characteris- tic impedance validation, high-voltage poten- tial withstanding, or other non-standard tests should be identified and defined in the docu- mentation. Conditions of testing and test point locations should also be clearly identified. Special Processing Requirements Special and/or non-standard processing requirements are occasionally required for flexible circuit designs and should be clearly outlined in the documentation. List of Applicable Standards and Specifications for Reference Standards and specifications are a unique type of glue that provide a consistency that holds the industry together. All relevant speci- fications that will be used to test, evaluate and accept or reject the product should be cited in the documentation package. For flex products, the acceptability criteria are listed in IPC-6013. 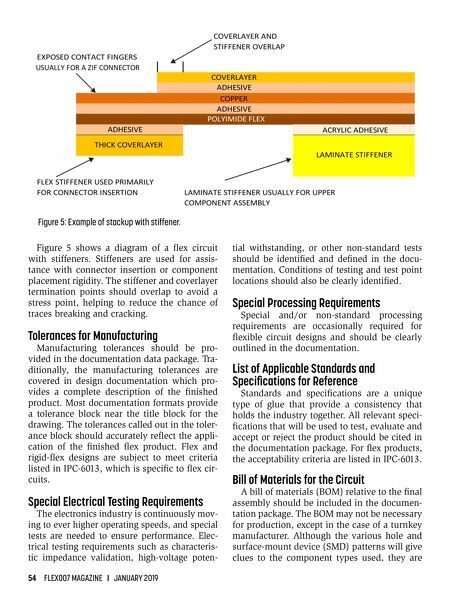 Bill of Materials for the Circuit A bill of materials (BOM) relative to the final assembly should be included in the documen- tation package. 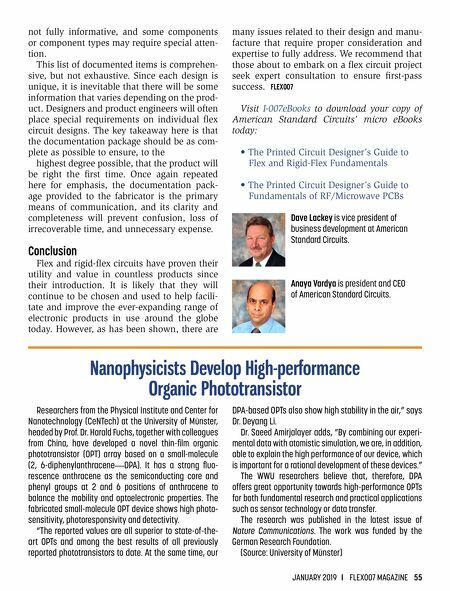 The BOM may not be necessary for production, except in the case of a turnkey manufacturer. Although the various hole and surface-mount device (SMD) patterns will give clues to the component types used, they are Figure 5: Example of stackup with stiffener.